Survey work being carried out at the Kasbah of Taourirt in southern Morocco as part of the preparation of the conservation and rehabilitation plan for the site. Photo: Claudia Cancino, GCI. For millennia humans have constructed buildings of earth. A universal and ever-present material, earth appears in ancient archaeological sites such as the pre-Colombian city of Caral in Peru, as well as in twentieth-century complexes like New Gourna Village in Egypt, designed by Hassan Fathy. Earth has been employed in a variety of geographic contexts and climatic conditions, and construction ranges in scale from vernacular housing to large complexes, such as the almost four thousand ksour of southern Morocco and the Great Mosque of Djenné in Mali. It has been superbly used in decorated surfaces, such as the high reliefs of Abomey in Benin and the earthen plasters of Cliff Palace at Mesa Verde National Park in the United States. While this legacy of earthen building constitutes a rich and vast heritage, earth remains a ubiquitous modern construction material and vital form of shelter. The United Nations estimates that nearly 24 percent of the world’s population live in earthen homes. In this respect, earthen architecture represents a significant aspect of both social and environmental sustainability, and it is a critical element of self-determination in many less developed regions. Recyclable and low in energy consumption, earthen construction has a minimal carbon footprint. While earthen architecture is often undervalued or erroneously viewed as substandard, it is a bastion of cultural and technological diversity in the face of a globalizing built environment. For this reason, over the past thirty years the Getty Conservation Institute has engaged in projects and initiatives to advance the field of earthen conservation, all of which have involved robust collaboration with institutions and professionals around the world. By working across borders and cultures, the GCI has sought to create new knowledge that capitalizes on both cutting-edge research and traditional know-how through its Getty Seismic Adobe Project (GSAP), the Terra project, the Earthen Architecture Initiative (EAI), and more. And by leveraging its resources toward collective action, the GCI has helped empower a global network dedicated to earthen architecture and its conservation. The scope of the GCI’s engagement in earthen architecture has expanded significantly over the past three decades, but its initial entry to the field was through badly needed scientific research. In the 1980s, a small but important project was launched at the site of Fort Selden, under the aegis of New Mexico State Monuments and the National Park Service Southwest Regional Office, to investigate the treatment of earthen archaeological remains. In 1988 the GCI joined New Mexico State Monuments to undertake Phase II of the research at Fort Selden, investigating chemical consolidants, capping, and protective coatings for the conservation of earthen walls, thus initiating the GCI’s direct engagement with earthen architecture. Given the prevalence of earthen architecture in earthquake-prone regions of the world, GSAP was established by the GCI in 1990, in cooperation with Stanford University, to develop and test minimally invasive and easily implemented techniques to avoid the collapse of historic earthen structures during seismic events. The necessity of improving both the scientific foundation for earthen architecture practice (in new construction and in conservation) and the level of collaboration among researchers prompted the initiation of a research survey in 1998. Under the auspices of the Terra project—an institutional collaboration of the GCI, ICCROM (International Centre for the Study of the Preservation and Restoration of Cultural Property), and CRATerre-EAG (International Centre for Earth Construction–School of Architecture of Grenoble)—the survey polled scientists and practitioners about research needs and initiatives in the field. The results served as the basis of a six-week online discussion among colleagues across the globe, which then led to an intensive one-day colloquium at the Terra 2000 conference in Torquay, United Kingdom. The meeting produced a set of research priorities that were disseminated widely to encourage individuals and institutions to undertake needed research and to promote collaboration. The priorities helped to focus future efforts of the GCI and to engage a broader community of researchers. They likewise helped lay the groundwork for important earthen architecture research around the world. As part of its promotion of knowledge sharing within the professional community, the GCI for the past thirty years has supported international conferences and colloquia devoted to the preservation of earthen architecture, working to foster an open, fruitful, and significant trade of ideas in the conservation of earthen architecture. After the GCI’s initial participation in the Fifth International Meeting of Experts on the Conservation of Earthen Architecture organized by ICCROM and CRATerre in Rome in 1987 (and building on its research at Fort Selden), the Institute, New Mexico State Monuments, and the National Park Service joined with ICCROM and CRATerre-EAG to organize the Sixth International Conference in Las Cruces, New Mexico, known as Adobe 90. 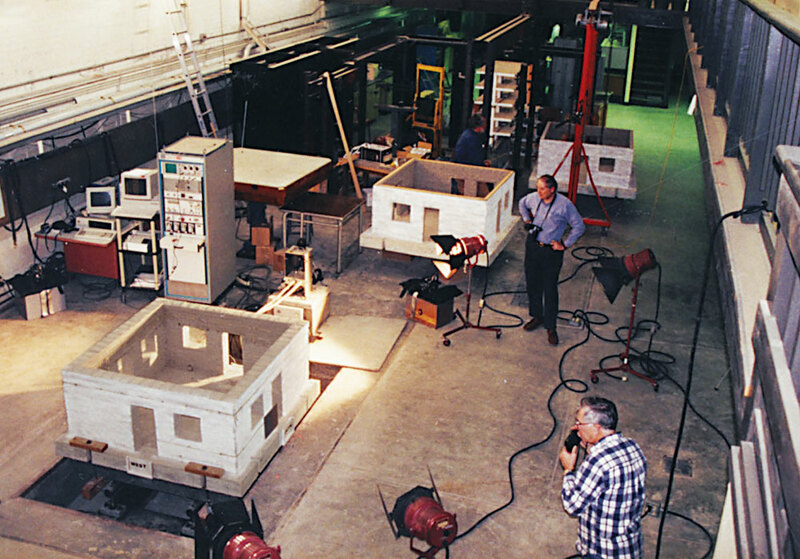 Members of the Getty Seismic Adobe Project team conducting testing at Stanford University’s John A. Blume Earthquake Engineering Center in the early 1990s. Photo: Getty Conservation Institute. Adobe 90 helped develop what had been relatively small and specialized meetings of experts into truly international conferences, greatly expanding the number and geographic distribution of participants and papers and producing substantive publications that helped legitimize the work of the field. It ultimately set a new standard for conferences within the earthen architecture community and fostered institutions in other regions to take on sponsorship of the conference, which now occurs approximately every four years and receives hundreds of abstract proposals. With the intention of organizing the first conference in Africa, the GCI partnered with the Ministry of Culture of Mali to carry out the tenth Terra conference. Four hundred fifty participants from sixty-five countries attended the 2008 conference in Bamako. To date, the eleven international conferences have strengthened collaboration, created regional networks, generated partnerships, and produced proceedings, two of which have been published by the GCI. The Institute’s commitment to promoting professional exchange is also manifested in the institutional support of professional networks such as ISCEAH, Proterra, and Mediterra. The latter developed its strategic planning in collaboration with the GCI in 2009. To address specific issues on the conservation of earthen sites, the GCI has organized several international colloquia. Under the umbrella of Terra, the GCI organized the 2001 “Protective Shelters for Archaeological Sites in the Southwest” colloquium in Tumacacori, Arizona. Three years later, the GCI (also under the Terra aegis) organized a colloquium in Mesa Verde, Colorado, to address the challenges facing the conservation of decorated surfaces on earthen architecture. In 2006, under the EAI, the GCI organized a colloquium at the Getty Center in Los Angeles to assess the impact and efficacy of GSAP. The GCI’s Seismic Retrofitting Project was created in response to the colloquium’s conclusions and recommendations. While all of the GCI’s endeavors in earthen architecture have sought to advance and share knowledge, education-specific initiatives have focused on developing a cadre of specialists in the field. Through the Gaia Project (a partnership of CRATerre-EAG and ICCROM), four Preservation of Earthen Architecture (PAT) courses were organized between 1989 and 1994 in Grenoble, France, bringing together professionals from around the world for specialized training in earthen architecture conservation. In 1994 the GCI joined the Gaia Project to translate the international PAT curriculum into a regional, site-based training program. Hosted at the archaeological site of Chan Chan in Trujillo, Peru, PAT96 and PAT99 integrated site management planning into the more technically oriented curriculum, in response to the need to contextualize conservation within a broader decision-making framework for heritage stewardship. The courses utilized case studies and developed didactic materials, so that participants were well equipped to share their learning back home. With this training partnership, the Gaia Project evolved into the Terra project, which provided a platform for institutional collaboration in research, education, and professional development. 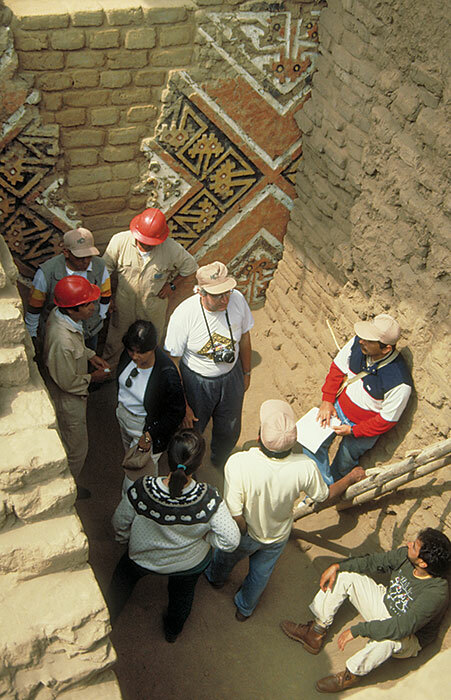 Participants in the PAT96 course, held at the archaeological site of Chan Chan in Trujillo, Peru. The course offered specialized training in earthen architecture conservation. Photo: Getty Conservation Institute. The cumulative PAT experiences helped build the network of those practicing and teaching earthen architecture conservation and led to the adaptation by universities of the course’s didactic materials and pedagogy, advancing earthen architecture as a field of study. This in turn contributed to the creation in 1998 of the UNESCO Chair of Earthen Architecture—Constructive Cultures and Sustainable Development, based at CRATerre. These developments then led to the EAI Guidelines for the Teaching of Earthen Conservation, a series of teaching and learning resources adapted from the course materials and available on the GCI website. Much has evolved in the field of earthen conservation since the GCI work at Fort Selden. The GCI’s approach to fieldwork has also evolved since then. After Fort Selden, the emphasis on implementing discrete interventions has developed into a holistic approach toward preserving earthen sites, while also designing solutions for problems that potentially have wider impact. An early example of more comprehensive conservation intervention is the Mogao Grottoes site stabilization work in the early 1990s, where windbreak fences were installed to mitigate windblown sand, and both environmental and color stability monitoring were carried out. A similar approach was implemented when Terra collaborated in the development of the management plan for the archaeological site of Chan Chan while carrying out the PAT96 and PAT99 courses. This holistic approach was later applied to the Triple Arched Gate in Tel Dan, Israel, in 2000. Terra and later the EAI promoted comprehensive planning as a powerful tool for the conservation of earthen sites, while recognizing the need to investigate specific interventions to address other issues jeopardizing such sites. In recent decades, special attention has been paid to the vulnerability of earthen buildings and the importance of adapting historic earthen urban settlements to safe and modern living conditions. In the last five years, the EAI has carried out model projects that seek to improve the way conservation interventions are carried out in two major areas: seismic retrofitting and rehabilitation of historic earthen buildings. 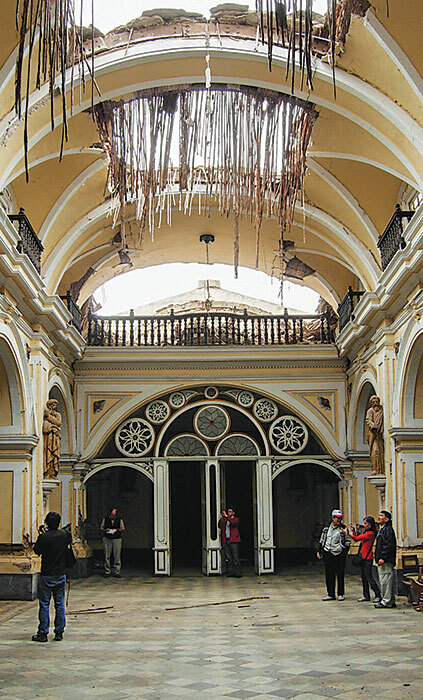 Earthquake-damaged Ica Cathedral in Peru, one of four earthen buildings being studied as part of the GCI’s Seismic Retrofitting Project. Photo: Claudia Cancino, GCI. In 2009 the GCI initiated the Seismic Retrofitting Project (SRP) with the objective of adapting GSAP techniques to better match the equipment, materials, and technical skills available in many countries with earthen sites. Using four Peruvian historic earthen buildings representing typologies across Latin America, the GCI—in collaboration with the Ministerio de Cultura del Perú, the Escuela de Ciencias e Ingeniería of the Pontificia Universidad Católica del Perú, and the University of Minho, Portugal—is designing, testing, and implementing seismic retrofitting techniques and maintenance programs with locally available materials that will improve the structural performance and safety of earthen buildings while minimizing loss of historic fabric. The Department of Architecture and Civil Engineering at the University of Bath and the Department of Civil, Environmental and Geomatic Engineering at University College London also have been SRP partners from 2010 to 2012 and from 2013 to 2014, respectively. 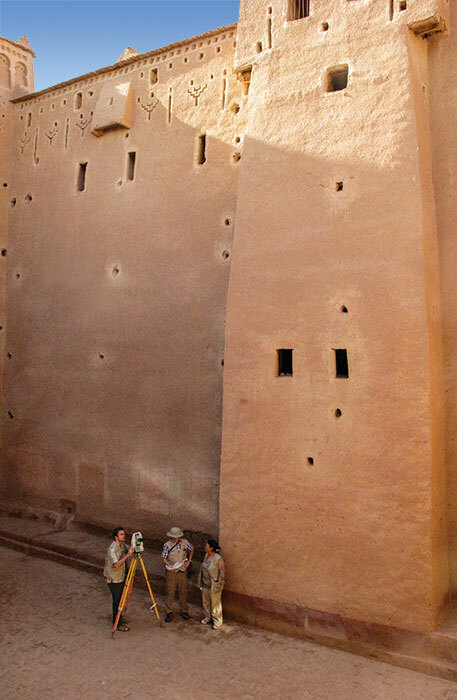 The Conservation and Rehabilitation Plan for the earthen ensemble of Taourirt in southern Morocco is another EAI model project—this one carried out in partnership with Morocco’s Centre de Conservation et de Réhabilitation du Patrimoine Architectural des zones atlasiques et subatlasiques. The project seeks to develop a methodology for the conservation and rehabilitation of this traditional earthen ensemble that can be used as a model for similar earthen sites across the Maghreb. The objective is to establish a conservation process that demonstrates appropriate reuse of such sites, respects the original building fabric, and preserves technical know-how. From its establishment, the GCI has contributed to the earthen architecture field by developing model projects and training programs, researching unanswered questions, and disseminating information on appropriate conservation interventions. Looking ahead, what is further needed to advance the field, and what role could the GCI play? The body of information thus far produced in the field of earthen conservation emphasizes regular maintenance as a preventive measure for damage control. Earthen buildings were conceived and constructed to be maintained by the societies that erected them. Finding solutions for suitable maintenance programs in the countries with earthen heritage should be one of the next steps. Developing proper maintenance practices will require greater understanding of earth and the way it behaves at the material and structural level. Notwithstanding the increase in international conferences and training programs, many regions of the world urgently need more education and assistance to bolster the conservation of their earthen sites. The GCI hopes that its endeavors in earthen architecture can contribute to more broadly advancing the field, particularly in those areas where such conservation efforts are lacking. Claudia Cancino is a GCI senior project specialist and project manager of the Institute’s Earthen Architecture Initiative. Erica Avrami, formerly with the GCI, is an assistant professor of historic preservation at Columbia University.